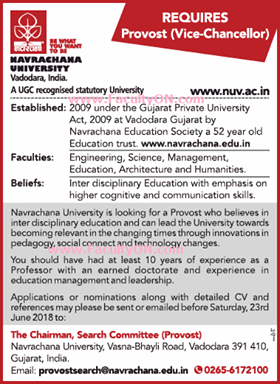 Navrachana University, Vadodara has advertised in THE TIMES OF INDIA Newspaper for the recruitment of Provost (Vice Chancellor) job vacancies. Interested and eligible job aspirants are requested to apply with in 23rd June 2018. Check out further more details below. About College: Navrachana University was established through the Gujarat Private Universities Act, 2009 with the intent to offer superior education that befits the high educational standards of the Navrachana Educational Society in Vadodara. The University has embarked on a new educational paradigm that lays simultaneous emphasis on disciplinary education, inter-disciplinary education, professional education and general education. This paradigm is facilitated by the University's unitary character and offers comprehensive learning and helps develop T-Shape students who have a breadth of knowledge though general and inter-disciplinary education and a depth of knowledge though focused disciplinary education.